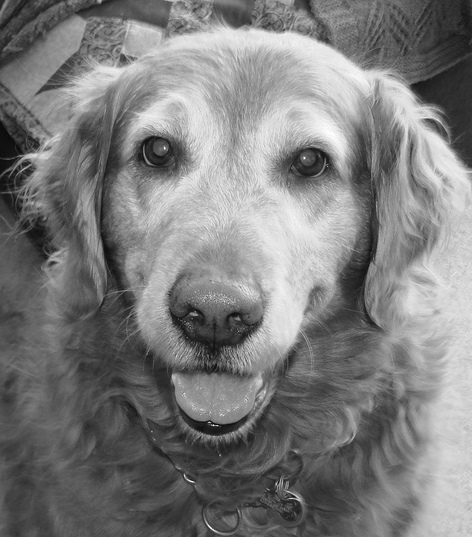 We lost our Golden Retriever, Ginger, this week. She had some major health issues that led up to our decision, and we feel it’s the right one. But it was the first time that DH and I had to have a pet put down, and it was gut-wrenching. We miss her, but know she’s at peace. It’s the end of the semester, and for some of our students, the end of their college journey. It’s bittersweet and something I am having trouble adjusting to in my switch from public to academic librarian: your patrons leave you. Of course patrons would occasionally leave in the public library setting. It’s different here, though, in that it’s planned that your patrons will leave. It’s the whole idea – we educate them, they graduate, and then go out into the world to the rest of their lives. So I get to know these students – some of them pretty well. I care about them. And a number of them will graduate in the next couple of days and I will probably not see them again. It’s sad. It’s the way it’s supposed to be, but I will miss them. So….off with you. Go have wonderful, fulfilling, productive lives. I hope we’ve prepared you for what is to come, and I hope you look back on your experience here with fondness. We’ll miss you. Originally uploaded by Daniel Solis. May I just say, Amen! We’re rapidly approaching finals week here at MPOW. I had a group of students in the library this morning, all of whom had to print out a tabloid-sized presentation for a class at 10:00 this morning. On the one printer that can handle color and tabloid paper. Not surprisingly, there was a bit of a log jam at the printer. Meanwhile, back at the ranch, the Clinical Lab students were printing powerpoint presentations on the same color printer. This is a development no one thought of, but it makes sense: the slides for the clinical lab students tend to have images of cells, which are in color. Printing them in black and white negates the advantage of coloring the cells differently. So the printer, originally purchased for art students, is being used primarily by health care students. I find this interesting. While the students printing the presentations were doing so as part of an assignment, the clinical lab students are printing powerpoint presentations that they’ve had in class. Instead of reading them online, they print them out to study them. It rather defeats the purpose of making these things available online, but I understand the impulse. So online is good…..except when it comes to studying and reading a lot of stuff. Makes me ponder whether e-readers are really going to take off for academic use. And remember, these aren’t fuddy-duddy old folks doing this – these are my freshmen and sophomore students. These are the people that grew up with technology. I”m not sure what to make of this, but it’s interesting to observe. Students are also using me more for reference, which delights me. I was grabbed en route to my office by a group studying in the main commons area last week, and I ended up helping three or four groups of students with their research questions. Of course, all this stuff is due this week. Apparently, doing things at the last minute is still the norm for college students. So it’s been quite busy here at the library. In a week or two, it will be very, very quiet. I’ll probably enjoy that for a day or so…..but then I’m going to miss these guys. Fall will being most of them back, along with a new crop of freshmen. I probably should enjoy the quiet while I have it. In the meantime, it’s back to answering reference questions, printing issues, and proctoring. I’ll check in later, when it’s quiet.